The honours undergraduate has finished her work on the toxin/antitoxin genes, and has submitted and successfully defended an extraordinarily good thesis. The thesis is written as a polished scientific paper, which is ready to submit except for some gaps in the data. My job now is to fill these gaps. She began by confirming the mutant phenotypes. We've already shown (Sinha et al. 2012) that the toxin knockout prevents DNA uptake as well as transformation. 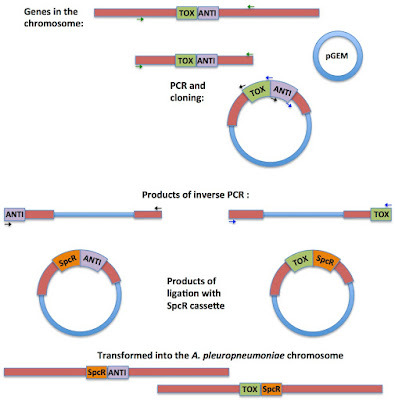 Under competence-inducing conditions the antitoxin knockout prevents transformation, and the toxin knockout and double knockout both have normal transformation. This is consistent with our hypothesis that the Toxin protein does something that prevents competence development, and the Antitoxin protein prevents this. Her next step was a phylogenetic analysis of the toxin and antitoxin genes. This work is complete. She identified three groups with the gene pair, and used synteny analysis to show that the pair entered these groups by independent horizontal transfer events. Because there is no outgroup she was unable to root the tree, so the order of transfer events is not established. 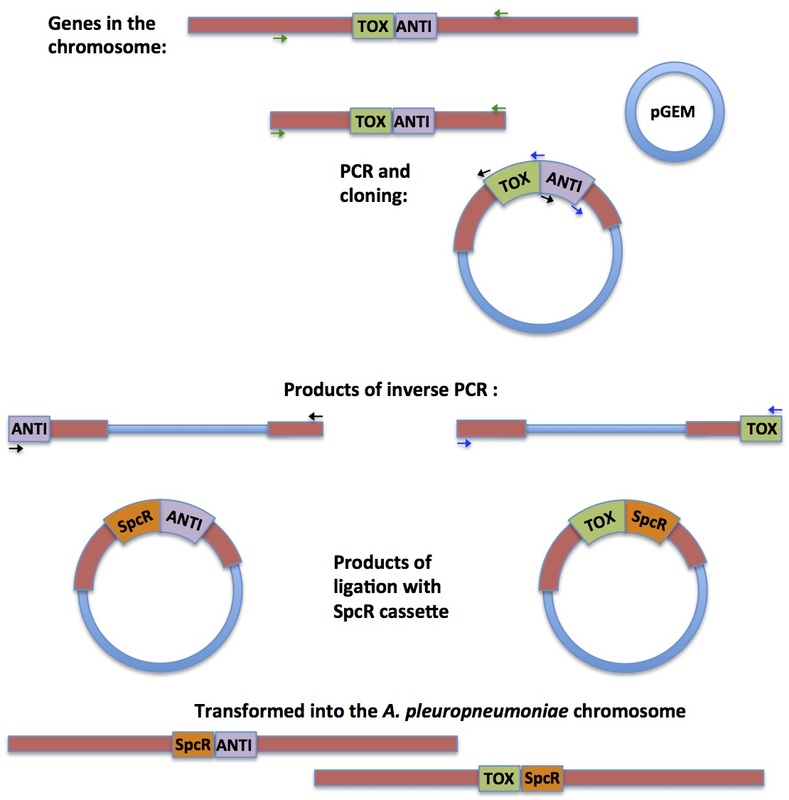 She then ligated SpcR cassettes into the linear PCR products, creating circular plasmids with the SpcR cassette replacing each (or both) genes, and transformed these back into the A. pleuropneumoniae chromosome, selecting for the cassette. 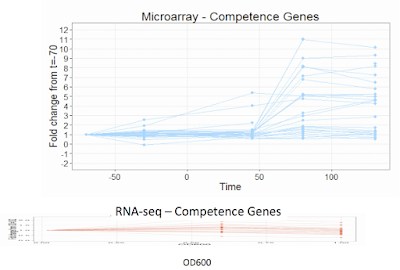 Once she'd made her knockout mutants she checked their competence phenotypes, and found that all were normal. 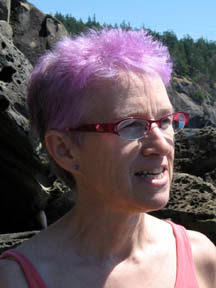 She would have concluded that the A. pleuropneumoniae toxin does not block competence development, but in the interim she had discovered that the GenBank record for the toxin gene was incorrectly annotated, missing the last 5 amino acids because these overlap with the start of the antitoxin gene. This meant that the antitoxin knockout she had created was also missing the end of the toxin gene, and therefore might have actually been a double knockout (if the terminal toxin amino acids are important for its function). So one of my jobs is to redo the antitoxin mutagenesis, using a new primer that preserves all of the toxin gene, and check the growth and transformation phenotypes of this new correct mutant. If I find that it has a transformation defect I'll also check its DNA uptake. 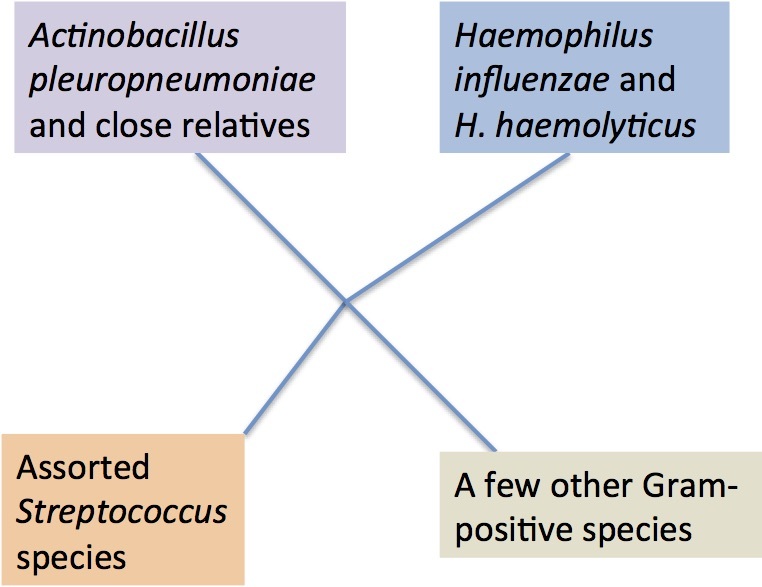 She then examined the growth properties of the H. influenzae and A. pleuropneumoniae mutants. The A. pleuropneumoniae mutants all grew normally, but the H. influenzae antitoxin knockout grew significantly slower in log phase than the other H. influenzae strains. This suggests that the H. influenzae toxin, when unopposed by antitoxin, interferes with cell growth even under conditions where the cells are not competent. The toxin knockout also grew a bit slower. She then examined the RNAseq data for the wildtype and knockout strains. 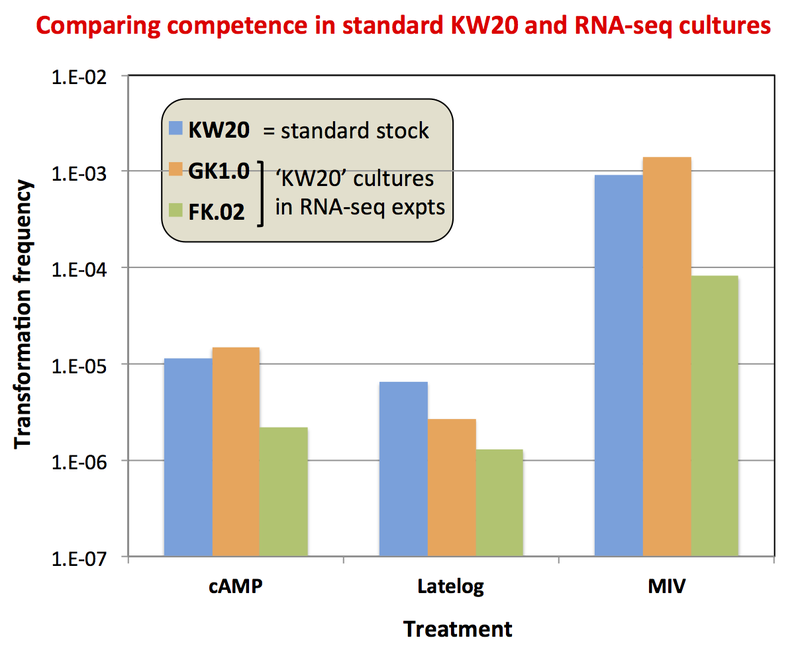 Each culture was sampled and sequenced at four time points: T0 is log phase in rich medium, just before transfer to the competence inducing medium MIV, and T1, T2 and T3 are 10, 30 and 100 minutes after transfer to MIV. Analyzing the data she had showed that log phase expression of the toxin mRNA increases dramatically when the antitoxin is missing - this is consistent with characterization of related toxin/antitoxin pairs, where the antitoxin protein represses transcription of the toxin/antitoxin operon. She found lots of other interesting (confusing/perplexing) effects. Since most of these are based on the single antitoxin-kockout replicate, we'll examine them more thoroughly once we have all three replicates. Last month I wrote a post about an old experiment (What can I recover from an old failed experiment). I concluded that some of the frozen mutagenized cells might be worth using, but that I would first need to test how effectively they had been mutagenized. Now it's time to do that. The cells were incubated with the mutagen ethane methylsulfonate (EMS), which alkylates G bases and causes G->A transition mutations. I can test the efficiency of this mutagenesis by plating cells on novobiocin agar plates, using a lower-than-normal novobiocin concentration (1 µg/ml rather than 2.5 µg/ml). I also need to test the overall viavbility of the frozen cells, by plating them on plain agar plates, but I'll need to do this anyway to test the mutagenesis. I'll thaw and test one tube of B and one of C; these should be representative of the others. Rather than just discarding the remaining cells I thawed, I could at the same time put these cells through the next step, by growing them at low density and transforming them with either novR chromosomal DNA or a novR PCR fragment (better because higher transformation efficiency). But I won't do this, because first I need to find the novR PCR fragment and test it. I just checked my old notes. In expt #1290 I had tested the PCR products (novR and nalR) and found that they gave only slightly higher transformation frequencies than MAP7 chromosomal DNA. 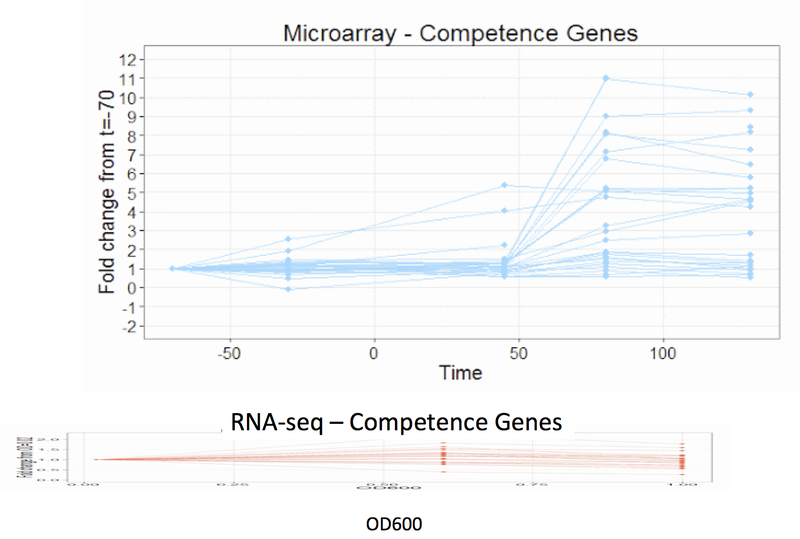 This is surprising, since the effective concentration of the resistance-conferring fragments is much higher in the PCR DNA prep (maybe 10-50-fold higher, depending on the concentration of the PCR DNA, which wasn't measured. The MAP7 DNA was used at a concentration that's saturating for transformation. BUT, on more carefully re-reading my old notes (as usual not as limpidly clear as I would desire), I can't be sure that the cells I have saved are the cells I need (they might instead be cells that have already been incubated with the wrong DNA). I think I'd better abandon this mess and start fresh. Next week I'm running a small science-communication workshop for some neuroscience grad students from developing countries. 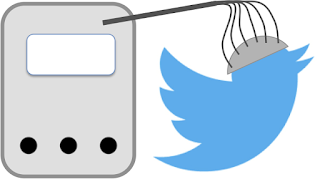 I don't know much about neuroscience, so yesterday I asked the Twitterverse to recommend accounts that neuroscience grad students should follow.